Yamaha reveals top-of-the-range Aventage A5000 AV separates | What Hi-Fi? UPDATE: Yamaha has confirmed the pricing for the two new Aventage components, with both the CX-A5000 and MX-A5000 set to cost £2500 each when they go on sale in September. 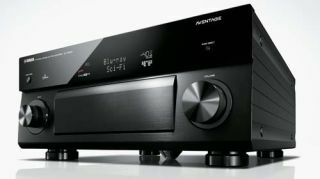 Yamaha has released details of its flagship home cinema Aventage Series separates, the new CX-A5000 preamp and MX-A5000 power amp. The "no compromise" Aventage home cinema products follow the launch of the top-of-the-range Yamaha hi-fi combination, the A-S3000 and CD-S3000. The 'A5000 models use proprietary Yamaha technologies such as Cinema DSP HD3 and YPAO sound optimisation, and support Apple AirPlay and DLNA streaming (with support from FLAC/WAV 192kHz formats), and work with Yamaha's AV controller app. The CX-A5000 preamp is described by Yamaha as the “digital heart of the system”, offering a hefty choice of 33 DSP listening modes, plus support for up to four presence channels. The 11.2-channel Aventage MX-A5000 meanwhile claims a rated power output of 150 watts per channel in to 8 ohms, supports biamping of all five channels, and can add up to two stereo zones to the 5:1 surround set up. Front and rear presence speaker connections are also available. The MX-A5000 is encased with a 1.6mm thick solid metal chassis, designed for maximum elimination of vibrations. Other design features include Yamaha's A.R.T Wedge, an H-shaped cross frame and a twice-thickened base. Sounds solid, not least as it weighs over 25kg. Both components use unbalanced RCA and balanced XLR connections, with the CX-A5000 also supporting a balanced audio input. There are 8 HDMI inputs and 2 HDMI outputs, which support 4K passthrough and upscaling, plus MHL connectivity for compatible smartphones. Yamaha's advanced HDMI zone switching allows you to choose from various audio and video sources for playback in the two supported zones, too. The MX-A5000 also has an auto power standby function (after eight hours, mind), while the CX-A5000 has two trigger out jacks. Connectivity is thorough to say the least. The Yamaha CX-A5000 and MX-A5000 are set for release in September this year and will cost £2500 each.